Football governing body Fifa has given a new life ban to former presidential candidate Mohamed Bin Hammam. The decision came in response to his decision to quit all football posts. The 63-year-old challenged Sepp Blatter in Fifa's 2011 presidential election but withdrew to fight bribery allegations he was later cleared of. The Qatari's new suspension is not related to those allegations, but "conflicts of interest" while president of the Asian Football Confederation. 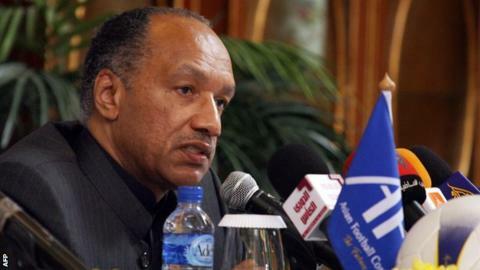 Bin Hammam's problems began when a report by Fifa executive committee member Chuck Blazer accused him and former Fifa vice-president Jack Warner of trying to secure votes by jointly organising a special meeting of the Caribbean Football Union (CFU) at which members were offered sums of cash for "development projects". He was subsequently banned from "any kind of football-related activity" by Fifa only for the Court of Arbitration for Sport (Cas) annulled the decision in July due to insufficient evidence. A new investigation into Bin Hammam's financial dealings, dating back to his time in charge of Asian football, was then launched by Fifa's ethics committee. This led to a 90-day ban which Cas refused to cancel in October.